Hard, flat, tough, solid. These are all words that you could use to describe concrete. But green? That’s not usually an adjective many people would apply to cement – unless, of course, they knocked over a can of emerald paint on their driveway… But here’s a rundown of some new environmentally friendly products that are paving the way to greener, well, pavement. Filtercrete: Recently used to green Chicago’s alleys (watch story here), Filtercrete is one of a few products that help improve normal pavement by making it porous. It is filled with tiny holes that allow water and air to flow between the surface and the soil. This reduces the runoff to local waterways, while increasing water input to local underground aquifers. Because water is less likely to be trapped in the porous concrete, there is a reduction in cracks caused by water freezing to ice. 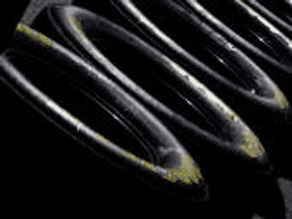 Filtercrete’s holes also harbor bacteria that break down contaminants like oil and grease, so water is cleaned as it passes into the ground. Flexi-Pave: KB Industries’ flagship product Flexi-Pave adds one more green aspect to porous pavement. 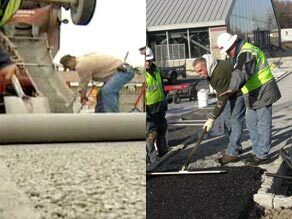 Used for ‘low-speed’ surfaces like sidewalks, trails, and parking lots, Flexi-Pave is made primarily of recycled tires. Considering they are used at a rate of one per person per year, there are a lot of worn-out rubber tires out there that could be diverted from landfills and recycled into pavement. Air-Purifying Concrete: It’s still in the research stage, but scientists at the University of Twente in the Netherlands are developing a form of concrete that could help clear nitrogen oxides from the air. Nitrogen oxides are those chemicals that cause problems like smog and acid rain, but this new concrete will contain a chemical – titanium dioxide – that converts nitrogen oxides into harmless nitrate salts. The salts are rinsed off the surface and into drainage systems when it rains, and the concrete should continue to perform over time. “[Titanium dioxide] is a catalyst, so it is enabling the reaction, but not participating, not consumed, so it never wears out,” says researcher Jos Brouwers. He adds that the air-purifying concrete could potentially be combined with porous concrete products like those mentioned above or even used in decorative facades of buildings. Results on how effectively the concrete performs in field tests are expected in 2009. So what do you think of these products? Where can green pavement go from here? When you think about discarded tires, you probably think of huge mounds of unwanted rubber, serving as mosquito motels and home to never-ending tire fires. Well, according to the Rubber Manufacturers Association, that's not as much of a problem as it used to be. As I was gathering information for our Powdered Tires story, I spoke with Mike Blumenthal, senior technical director for the Rubber Manufacturers Association. He told me that there's been a metamorphosis in tire re-use over the past 17 years, and that the industry is still evolving at a rapid pace. He said in 1990 more than ONE BILLION tires lay neglected in tire dumps, but today that number is down to fewer than 188 million. That's remarkable, especially considering that we manufacture more tires now than in 1990. Entrepreneurs are striving to find all sorts of uses for discarded tires. Blumenthal said the most popular market is for fuel. Tires burn like coal, except cleaner and hotter. But the fastest-growing use is for making products like belts and hoses and for mulch and cover for playgrounds and sports fields. I recently tested out a playground covered with rubber chips. Wish they'd had that when I was a kid – would have saved me a lot of bumps and bruises. Got to go now – time to rotate my tires.